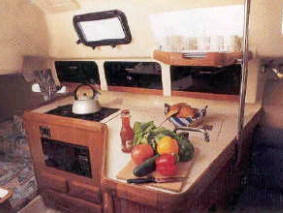 The accommodation aboard this beautiful, well designed Hunter is ideal for a couple, two singles or a family. You'll love the roomy cockpit. 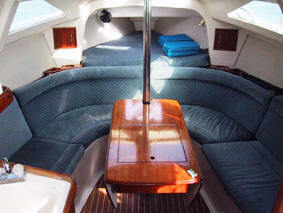 An oversized mainsail and easy tacking (roller furling) jib make this an easy boat to sail. The Hunter 295 has accommodation for 4 guests in 2 cabins. Aft is a full double berth. The forepeak holds a v-berth for 2 people. There is one head with a shower. 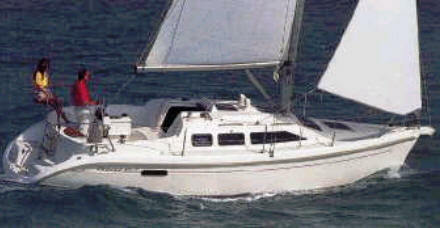 Walk-through cockpit, aft swim access with shower, bimini, refrigeration, CD player, wheel steering and lazy jacks. She has great privacy for a honeymoon couple as well as plenty of room to entertain out of the cockpit.